Interested to find out what happened during the famous trial of Socrates? If so – this is the book to do it. 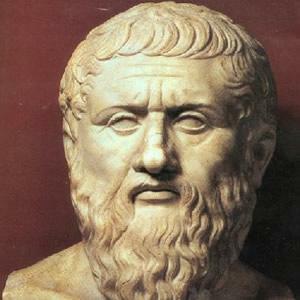 Who Should Read “Plato Apology”? And Why? Just yesterday we summarized for you a discussion between Socrates and Euthyphro concerning the charges brought up against the philosopher and taking place just a few weeks before the trial against him. If that seemed like something interesting, then you should definitely read this one! 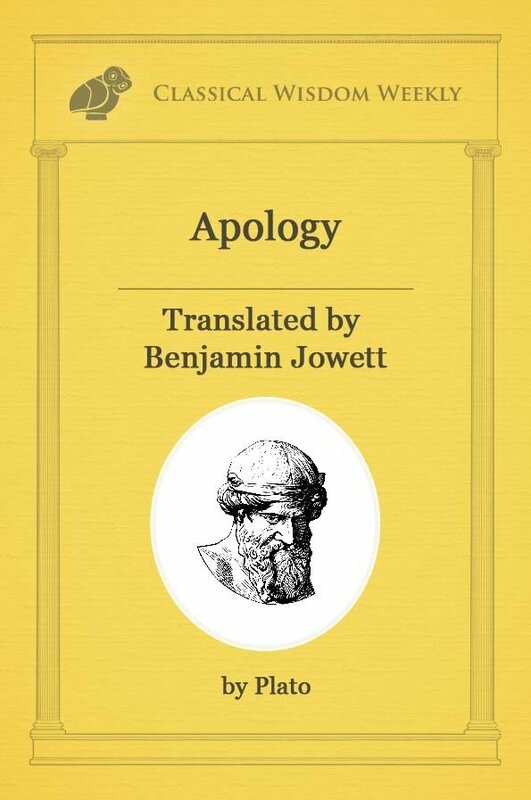 Because the Apology is basically the sequel to Euthyphro: it presents Socrates’ legal defense at his trial; and it is undoubtedly one of the most beautiful works – fiction or non-fiction (Plato tends to blur the line between the two) – ever written. Not only it has all the intensity and allure of some of the best courtroom movies in history – but it can also teach you a lot about the value of integrity and honor. It’s basically a book-length version of Al Pacino in The Scent of a Woman! is one of the greatest philosophers in history, widely considered the man who gave the word “philosopher” its meaning. A student of Socrates, he tried compensating for Socrates’ abhorrence of the written word by making his teacher the main character of most of his works. Some of them – such as the Apology, Symposium and The Republic – have lost none of their beauty or scholarly appeal even two and a half millennia later. Plato is also the founder of the first institution of higher learning in the history of Europe (and possibly the world): the Academy of Athens. Many intellectuals came out of it through the years, the most prominent among them perhaps the only one whose name deserves to be uttered in the same breath as that of Plato: Aristotle. We know they say Plato’s Apology of Socrates (by the way, in case you’re interested, there’s another book by the same name written by Xenophon) is a Socratic dialogue, but this one should be much more appropriately described as a Socratic monologue. It is a brief work which consists of three parts. The first and the longest one contains Socrates’ legal self-defense; the second part is made up of Socrates’ proposal for his sentence after being found guilty; and the third one entails Socrates’ lofty comment upon his actual sentence. In the first year of the fourth century before Christ, Socrates—then in the 70th year of his life—was accused by Meletus, Lycon, and Anytus of two offenses: impiety and corruption of the Athenian youth. According to Socrates’ speech, Meletus has accused him on behalf of the poets, Lycon represents the rhetoricians, and Anytus (Socrates’ arch-enemy) is there on behalf of the craftsmen and politicians of Athens. According to Athenian law, the accused was expected to defend himself, and the accusers were required to be present at the trial; the accused had the option of cross-examining them during his speech, a right Socrates would use only in the case of Meletus. The verdict was then decided by five hundred jurors, all of which were obliged to put a white stone if in favor of the defendant and a black one if against him. Socrates begins his defense by telling the judges that their minds have been poisoned and that he has done nothing a reasonable man wouldn’t do. He is a philosopher, after all, and that, by definition, means that he is in constant pursuit of the truth. Now, why would anyone want to punish someone for being interested in the truth? Well, Socrates has an answer for that: those who don’t want the truth to be found out. In other words, the ones who thrive in lies and deceits and the ones who will be exposed as frauds in case the truth is ever revealed. As far as Socrates is concerned, this whole affair started when Chaerephon, a friend of Socrates and also a friend of the accusers, went to the Oracle of Delphi and asked the prophetess whether there is anyone smarter than Socrates. Now, Socrates was a bit confused: there were so many people (politicians, rhetoricians, poets) deemed far wiser than him by almost everybody—including Socrates himself! However, the Pythian prophetess was famous for the accuracy of her predictions and Chaerephon would gain nothing of lying about the answer. So, Socrates did what he deemed most appropriate: he went to a politician with a reputation of wisdom and started a discussion with him to prove to himself that there are far wiser people than him. However, the result was staggering: even though he claimed so, the politician knew nothing more than Socrates. Well, although I do not suppose that either of us knows anything really beautiful and good, I am better off than he is–for he knows nothing, and thinks that he knows. I neither know nor think that I know. In this latter particular, then, I seem to have slightly the advantage of him. The underlying meaning of it? It is precisely because I know that I do not know many things – that I am wiser than the rest of you. In simpler terms: I am wise because I am honest with myself and because I can admit before myself that I am, actually, not wise. And that is the Socratic paradox. Next, Socrates proceeds to cross-examine one of his accusers – Meletus, there on behalf of the poets. It seems that Socrates (as Plato demonstrates quite a few times) didn’t have a very high opinion of poets. As skilled as they are in crafting verses, he believed, they are not that smart; the only reason why they are capable of putting so many smart things into words was not because of them, but because of the Muses. In other words, without their help, they are no better than the regular folks. And, as Socrates proves, Meletus is no exception. During the brief cross-examination, Socrates demonstrates that Meletus has both accused him of atheism and of believing in some spiritual forces and demigods. Since this is a contradiction, there should be no discussion whatsoever whether the accusation is sensible or not. It is only obvious that he is tried because some people want to exact revenge on him for exposing their ignorance before the world. Now, Socrates says that he is quite aware that there’s an easier way out of this. Namely, he can simply admit to his offenses and get away with his supposed crimes. But the fact that these are not crimes, but good deeds would mean that, paradoxically, in trying to save his life by admitting to some imagined offenses, Socrates would in actuality make an offense; moreover, against the one thing he had cherished throughout his life: Truth. And that, as far as he is concerned, is much, much worse than dying. That is why, he says, he doesn’t fear his death. In fact, to his eyes, his death should be feared much more by his jurors and his accusers. Because, in the end, they are the ones who will lose by it. And now, Athenians, I am not going to argue for my own sake, as you may think, but for yours, that you may not sin against the God, or lightly reject his boon by condemning me. For if you kill me you will not easily find another like me, who, if I may use such a ludicrous figure of speech, am a sort of gadfly, given to the state by the God; and the state is like a great and noble steed who is tardy in his motions owing to his very size, and requires to be stirred into life. I am that gadfly which God has given the state and all day long and in all places am always fastening upon you, arousing and persuading and reproaching you. And as you will not easily find another like me, I would advise you to spare me. By a narrow margin, the jurors find Socrates guilty. Since one of the possible penalties in the case of Socrates is death, according to the practice of the Athenian law, both he and his prosecutors were then required to propose a most appropriate sentence. Free meals for as long as he lives! After all, that’s what Olympic athletes and prominent citizens get! So why shouldn’t Socrates too for acting as the social gadfly of Athens? Needless to say, Socrates’ proposal is quickly dismissed by the judges. Expectedly, they go with the proposal of the accusers which is much more brutal and conventional: death. And what does Socrates think about the alternatives: imprisonment or exile? Not a chance in the world—once again, they are worse than death. Because Socrates is interested in truth and the only way you can find it is by examining others. And that is something he wouldn’t be able to do if in prison or far from the most prosperous city in the world: Athens. “The life which is unexamined is not worth living,” points out Socrates in yet another aphoristic gem of his. Fearing for the life of the wisest among them, Socrates’ supporters – Plato, Crito, Critobulus, and Apollodorus – ask for an alternative to be considered: a penalty of 30 minae, or 3,000 drachmae. No way, say the judges. It seems that Socrates’ sarcastic and irreverent sentence proposal had cost him quite a few votes. Now, even more of the jurors (at least 280 of them) condemned the philosopher to death. However, Socrates shows no remorse. He comforts the ones who voted for him and warns the others that by condemning him they have merely incited the criticism of the younger generations of philosophers who will undoubtedly follow Socrates’ example. Because, if the former, “eternity is then only a single night” and the joys of all earthly days are incomparable to the bliss of a calm and peaceful nap. If the latter, then he is about to meet some of the most famous people in history and be able to have conversations with them for all eternity. After the Oracle of Delphi had claimed that Socrates is the wisest person on the planet, the confused philosopher went about asking other people, supposedly far wiser than him, what could this mean. That, even though these people—be they poets or rhetoricians, craftsmen or politicians—were convinced that they knew more than him, in actual fact, they knew more or less the same amount. The only difference: unlike them, Socrates was aware of what he didn’t know. And that is what had made him the wisest person. So, be honest with yourself: there are so many things you don’t know, even though you think you do. Socrates could have proposed exile or imprisonment as an alternative to his death sentence; there’s a high chance that such a proposal would have been granted to him. However, believing that a man can grow wiser only through discussions and disagreements, he preferred death to being alone or away from the Athenians. “The unexamined life is not worth living,” he remarked. Quote Socrates the next time someone asks you why you scratch your head over such trivial matters such as the meaning of life instead of living it. Maybe you’ll make that someone think. Unlike many intellectuals, Socrates taught both through his words and by example. He could have easily escaped the death punishment; however, to him, losing his integrity was worse than being punished to death. Don’t ever forget that such people existed: they are evidence that such people can exist. In our opinion, they are the ones who make this human adventure worthwhile. 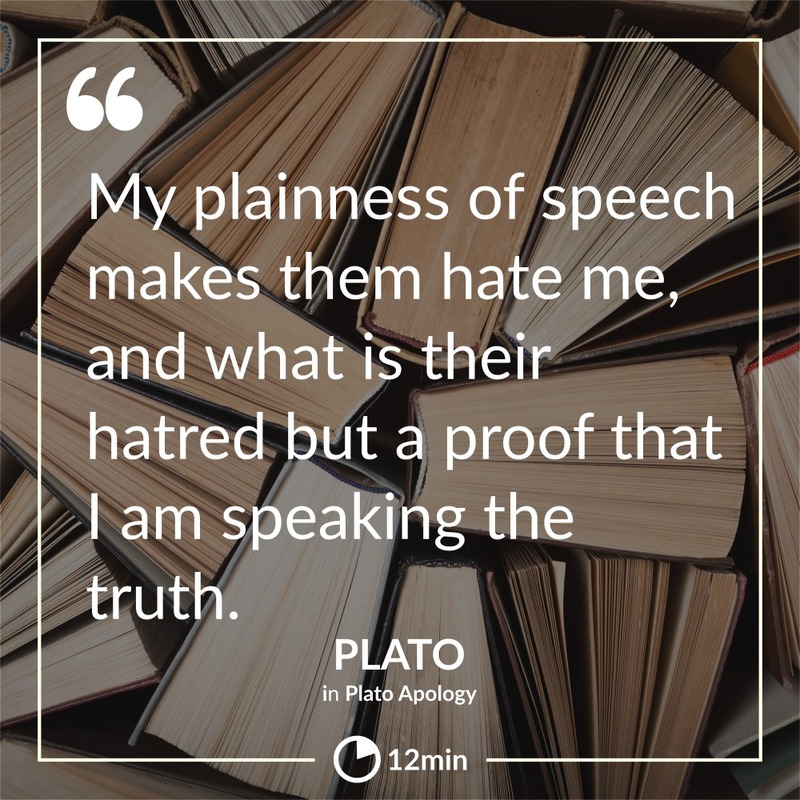 No matter how many positive adjectives we try to use here to describe Plato’s Apology, we probably still wouldn’t be able to do this work justice. We like it so much that even if forced to take only 5 books to a desert island, we would include the Apology in our choice.